What is SpotCam Cloud Video AI Service? SpotCam Cloud Video AI Service is a cloud base video analysis service, take advantage of advanced AI video analytics on SpotCam cloud platform, the high-performance cloud server will calculate and detect the specific event of your camera video, and you will receive instant push notification or mail notification when there is a specific event detected in the video. 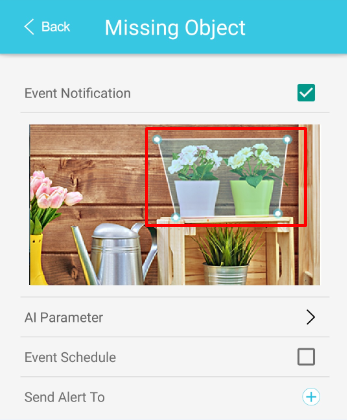 Furthermore, all event of interest will be listed in Event list on your SpotCam mobile app or display on the time line on the web browser interface for easy review. We not just help you to analyze the camera video but also let you easily find the specific event and playback event footage. Missing object can help you to protect your important asset, and keep it safe all the time. 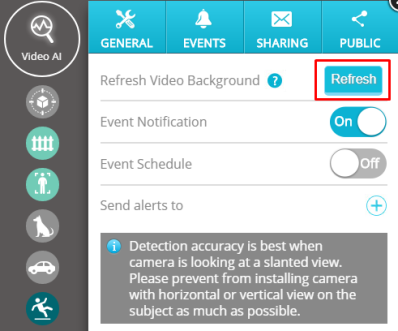 After you subscribed this service, just go to camera’s setting page and enter Video AI section and then enter Missing Object’s setting page, adjust the square area and drag it to cover the object you wants to protect, then your will receive the notification whenever the object is moved. Below screenshots are the setting pages of Missing Object function on web browser and mobile app. Note: The accuracy of this detection is related to the size of the target object. It is suggested to make the target object account for at least 10% of your camera video to get best detection accuracy. The only thing you need to do is to draw a line and make it work as a virtual fence, then you will receive the notification when someone crossed the line in the video. 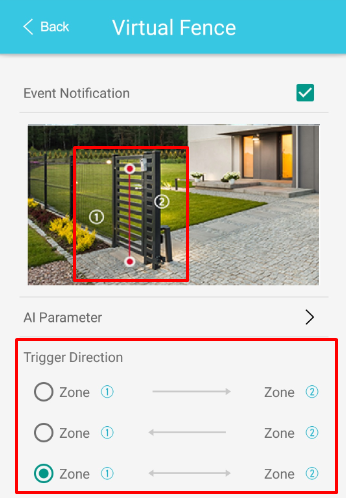 Please be informed you can setup the direction for your virtual fence, so you may configure to only trigger this event when someone cross the virtual fence in a specific direction. Human Detection can help you to reduce false events triggered by insignificant activities in the video such as tree leaves falling, shades moving, or curtains flying, etc, it will only trigger events when there is a human moving in the video of your camera. 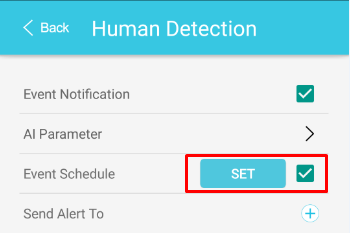 You don’t need to setup anything after you subscribed the Human Detection service, just make sure the function is enabled and it will start detect human activities in the video and send out notification. Pet Detection can help you to ignore other motion events and only trigger when detect your pet moving. This function can work for dogs, cats, and most pets. You don’t need to setup anything after you subscribe to the Pet Detection service, just make sure the function is enabled and it will then trigger when your pet is moving in the camera video and send out notification. Note: You will have the best accuracy if you place your camera to look at your pets horizontally, and please do not place your camera at the ceiling or make camera video slanted when using Pet Detection function. This service can help you monitor if there is someone parked his car in front of your house or in your parking space. It will trigger whenever a moving vehicle is detected in the camera video and send out notification. You don’t need to setup anything after you subscribed to the Vehicle Detection service, just make sure the function is enabled and it will then detect if there is any car moving in front of the camera. Note: The accuracy of this detection might be affected by the headlights of the vehicle during nighttime. Please prevent the camera from looking directly at headlight to improve the accuracy in the night. This service can help to send you a notification whenever it detects a human falling and not getting back up quickly. 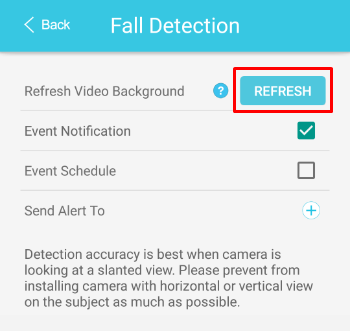 After you subscribed to Fall Detection service, please go camera setting page and then enter Video AI setting and then enter fall detection setting page. In fall detection setting page please first click on refresh button to refresh the background of the camera video. Please make sure there is no one or objects moving in the video when refresh camera background Once you finished the initial setting, the system will start detect human falling and you will receive the notification if they are not getting back up in a short time. Note: Detection accuracy is best when camera is looking at a slanted view. Please prevent from installing camera to look at the view horizontally or vertically as much as possible to have better accuracy. 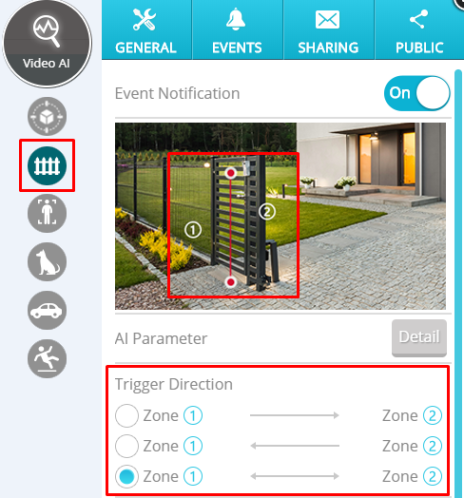 Aside from above general guide lines, when necessary, to increase the detection accuracy, please be informed you can set camera’s view angle and select the environment in each Video AI service setting page. You can also check the tips in each service setting page. SpotCam Cloud Video AI Service provide 7-day free trial for user to try the video AI service before subscription, allow you to determine whether the AI can meet your expectation. For more information, please click here. How to setup alert schedule for video AI service? 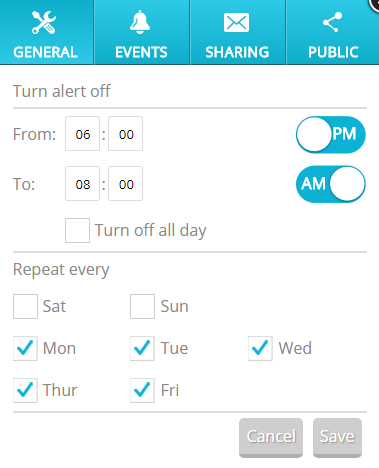 Alert schedule can help you to disable the video AI service at specific time when you don’t need the service to work. 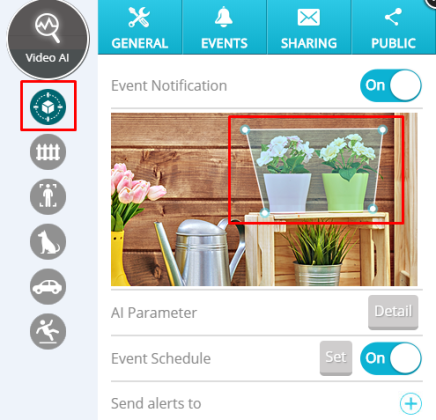 To setup alert schedule for your video AI service, please go to camera setting page and then select video AI, then choose the AI service you want to enable schedule, and then turn on the alert schedule function. 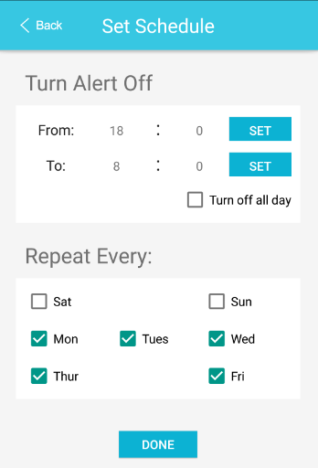 Below screenshots are schedule setting interface on web browser and mobile app which you can find in each AI function setting page. 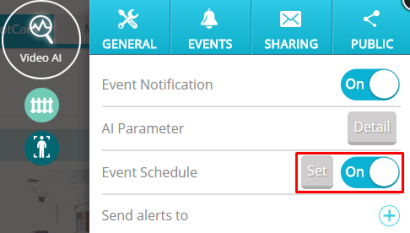 Select the time range when you want to disable the AI service and click “Save” button to finished the alert schedule setup.